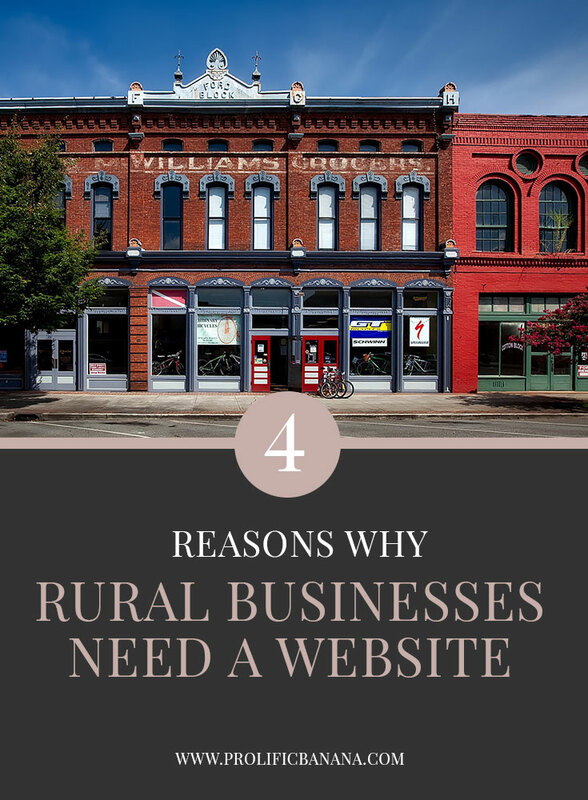 Rural businesses need to invest in websites now. A rural business website is often out-of-date or non-existent. I’m from Jefferson, a small community in Central Iowa. It’s about an hour from Des Moines and about 30 minutes from any community that is over 4000 people. That’s right. The largest community in a 30-mile radius is 4,000 people. Business is done just about how it’s always been done for the past 30 years, with a few additions, like using Facebook pages. It’s safe to say that for the most part, rural communities are about 10 years behind. If you are in a rural community, you know that newspapers, mailers, and radio ads are still a marketing tactic going strong. Business in small towns need to invest in a website though. Many businesses rely on word-of-mouth to get more business. Don’t get me wrong, word-of-mouth is worth it’s weight in gold. When you live in a small community – that gold is limited. If you’re relying on the local community to support your business, inevitably you’ll see your business stop growing. Small communities have a low ceiling and cannot grow your business beyond a certain point. If you want to scale your business, you need to look to the online world to target more customers. You’re throwing spaghetti at the wall. Radio ads and newspapers go to everyone. They aren’t targeted and are not reliable. I once was a creative director at hospital and we discussed previous marketing campaigns. Some of the research indicated that people heard about us from the billboards we had. We hadn’t had billboards for over 5 years. Small towns means small budgets. Besides running out of people to sell to, the people you can sell to can only afford so much. The average income in my town is 35-40k/year. Most jobs don’t pay more than $9/$10 an hour unless you’re a teacher or welder. As a business owner, this means that you cannot charge a premium rate. If you do, you cut your potential sales drastically. This can work, depending on the business, but the chances of your community’s ability to sustain your business are slim. Let’s be honest. We live in a “now” society and we don’t want to spend more time than absolutely necessary researching things. When someone is in need of your service or product, they’ll most likely look online. If they cannot find you on Google (Or Bing.. or whatever else people use) they’ll go with whoever they will find. Of course people take reviews and recommendations into consideration, but as most decisions are made quickly, they’ll go with who they can find. If your competitor is online, easy to find, and has reviews – you’re probably going to lose that battle. Your job is to make it easy for people to find you and to do business with you. You have something people want, so don’t make them work too hard to get it. Here are 5 tips to improve your site. This goes hand-in-hand with scaling your business. You can only do that by implementing repeatable steps into your business. If you’re relying on newspapers and word-of-mouth, you cannot predict your sales, plain and simple. Having a website gives you concrete data and shows you in real-time how things are doing. You can develop a powerful marketing system that gets you more business – and you can keep doing it over and over. Yes, yes it is.It allows you create a journey for your potential customer and it allows you connect with your customer. You can gather their name and email address or have a chat system in-place so you can chat while they are on your site. You take this cold contact and turn them into a warm lead and guide them on a journey to doing business with you. You can put them on an email list, you can follow up with them at any time, and you can target them in ads. Websites can provide your business with endless opportunities. The best part? You can control it. Facebook can dissappear over night. This is important. You don’t own Facebook. You don’t own the list that shows you who all “likes” your page. What happens if Facebook decides to close shop and turns off their site? You suddenly lose the ability to connect with your fans. I don’t know about you, but when it comes to my business, I want to have control over my business. Having a website gives you that control. Whether people are giving you an email address or you’re chatting with them, or they’re putting something in their cart and then clicking off the page – you have information about them. You have the ability to target them. Building a website is a big deal and it can be time consuming. It’s easy to put off, especially if you are seemingly doing well. Relying on your community is risky. Taking control of your business by developing a marketing system will allow you to scale. It’ll give you the tools to repeatedly implement your system. ready to get more sales?